MSD752E is an economical 2-phase hybrid stepper drive, using the latest 32 DSP technology, providing precision 0.05A current setting unit, and taking advanced digital filtering techniques, anti-resonance technology and precision current control technology, to make it implement precise smooth operation, extra low noise . It’s widely used in semiconductor, electronic processing equipment, laser processing, medical equipment and small CNC. It is capable of driving frame size of 42mm, 57mm, 60mm & 86mm of two-phase hybrid stepper motors.
. 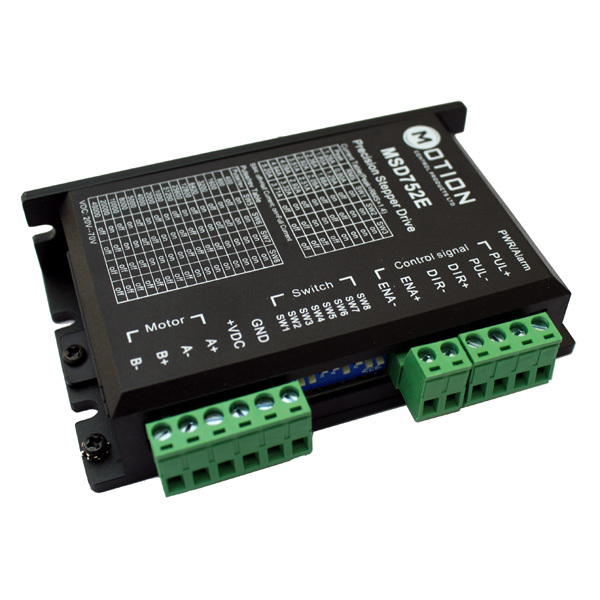 It is suitable for driving 2-phase and 4-phase hybrid stepping motors. Suitable for a wide range of stepper motors, from NEMA size 17 to 34. It can be used in various kinds of machines, such as X-Y tables, labelling machines, laser cutters, engraving machines, pick-place devices and so on. It is ideal for the applications where low noise, low heating, high speed and high precision are required. Notes: We recommend our MCP power supply RSP-320-48 to go with this drive.